Hunting is a passion for a lot of people all around the world. People who enjoy hunting love the surroundings which are beautiful and bountiful of their preferred game. Hunting snow geese is a lot of fun. Missouri snow goose hunting is famous all over the world for the adventures it offers. What makes Missouri snow goose hunting stand out is that it offers world- class hunting locations that are fun and yet thrilling. Missouri is a state in the United States of America which is famous for the hunting it offers. 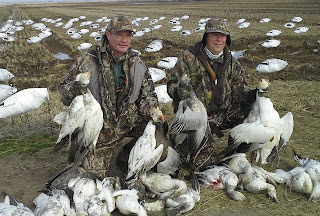 Though many of types of hunting is available and conducted in this state, it is really famous for its spring snow geese which are available in abundance. In fact that is one of the reasons Missouri is on the world map! Because of the snow goose hunting adventures it offers. No wonder not only do people from the outside the state, but also people from outside the country come to hunt here! The local people indulge in it as it is quite a pastime. The destinations and hunt varieties that Missouri snow goose hunting offers is mind-blowing to say the least. If you enjoy hunting at all, you are going to love it! If you have never really hunted before, then this is indeed the best place to start! You will have a lot of fun getting acquainted with goose hunting. Missouri as a state has a high harvest rate for snow geese and that is the reason why it is so popular as a hunting location. If you are planning to enjoy Missouri snow goose hunting anytime soon, have a look at the following advice. It is certainly going to help you become a better hunter. When setting out your decoys for snow goose hunting try to make them look natural and relaxed. Whether you are using full body or wind sock decoys, space them out in family groups this will definitely fetch you better results. A lot of hunters who don't know better bunch the decoys on top of each other. This is hardly the right way to go about it. Instead, spread the family groups a little distance from each other and make a lot, look like a lot more! If you are on a Missouri snow goose hunting hunt on a windy day, then you may have to make some adjustments. The geese may land short of the decoys making it difficult for you to shoot them. That is why placing yourself at the head of your decoys better bet. Calling aggressively, though not necessarily more, also helps at times. Last but not the least, everyone in your group should remain as still as possible until the geese are in range. Keeping absolutely still will ensure that the geese don't see the unnatural motion and go off somewhere else.